Paul, who is six years old, has combined vision and hearing loss due to CHARGE syndrome. He lives in Northern California with his parents, Angelica and Paul. 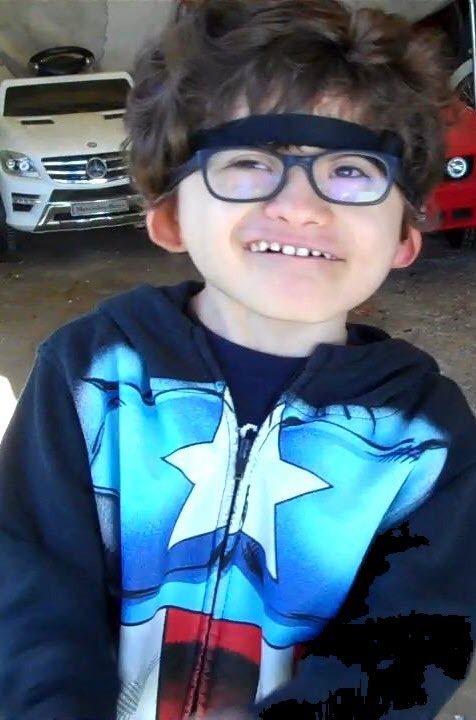 Always happy and energetic, he enjoys being outdoors; riding on swings, wagons, roller coasters, and horses; and playing with phones and iPads. Angelica and Paul Sr. have made it a priority to connect with other special needs families. Several years ago they attended the CHARGE Syndrome Foundation's biennial conference in Chicago and met families and professionals from across the nation. They also communicate with other parents through Facebook groups and attend events hosted by their state deaf-blind project. Watch the videos to meet Paul's family and get a peek into his day-to-day life. Be sure to check out the box below each video for additional resources. An overview from the CHARGE Syndrome Foundation. From Boys Town National Research Hospital. ANGELICA: My name is Angelica. And this is my husband, Paul. And our son is Paul. He's six years old. And he has CHARGE syndrome. And when Paul was born, we didn't know he had any issues. So when he was born, about a week later, they said we think he has CHARGE syndrome. He was in the hospital for six weeks. And they did the testing. So it came back positive at about five, six months later that he had CHARGE syndrome. Of course, we didn't know anything about CHARGE syndrome. And we are still learning every day new things about CHARGE syndrome. Four-- five-- six-- ten-- all right. Nine, nine. He has many health issues. Right now everything is under control. ANGELICA: He is stable. And he has vision and hearing loss, heart issues. He also has a diagnosis of autism. Previous years, we were in and out of the hospital. I mean, for one thing or another, he was always in and out. And we'd spend many, many nights in the hospital. He has gone through quite a few surgeries. He's profoundly deaf on one side and moderate on the other side. He wears a BAHA hearing aid, which is a bone conductor hearing aid, where the sound travels to the bone. So he's able to hear. And right now he only wears it on one side. But he's going to go in for another surgery because he wears a headband. So he's going to go in for surgery, so it's going to be attached. But it's going to be on both sides. His vision, you know, it's been really hard to find out how much-- how well he can see. His doctor thinks that he can see pretty much everything that is close to him. We don't know how far he can see. PAUL (FATHER): And they say he's nearsighted. ANGELICA: He is nearsighted. But he wears glasses. And lately he hasn't-- doesn't really want to wear his glasses. But he's able to find the tiny little things on the floor. So he does use his vision really well. He does have colobomas in both eyes. I mean, it's always a concern because when a kid's got, you know, anybody that has colobomas, if there is a fall, if somebody falls or they get a big hit on the head, their retina can detach. So it's always a scary thing. But we try not to think about it because we have so many other things to worry. ANGELICA: He's always happy. He's always happy. PAUL (FATHER): He is a happy child. ANGELICA: He is always happy. PAUL (FATHER): Even though he has, you know, his diagnosis of CHARGE syndrome, I wouldn't trade his personality for a normal kid. ANGELICA: What? You want phone? He's looking for the phone. ANGELICA: I don't have it. I don't have the phone. A one-page article from the CHARGE Syndrome Foundation. PAUL (FATHER): Say hi, Pop-posh. Say hi. For everything, he's like, "Hi" [waves]. Because he is learning how to say "hi." So everything's "hi" or "bye." ANGELICA: He doesn't say any words verbally. Sometimes he says "mom." PAUL (FATHER): Kind of mumbles, yeah. ANGELICA: But he does hum songs, so like "Twinkle Twinkle Little Star," "Bingo" song, so he hums the songs. And he just makes a lot of sounds. ANGELICA: We're hoping that he will eventually learn how to talk, even a few words. But at this moment he's not, so we communicate using pictures, sign language. And a lot of times he will guide your hand for anything he wants. He will hold our hand if he wants to go outside; he holds our hand and gives us a picture that he wants to go outside. Or whatever he wants to do, he's always guiding our hand. He does listen to basic commands. If I ask him to stop, he'll stop. Or, "Come on, let's go outside," and he'll follow me. PAUL (FATHER): Here. Come here. Paul. Come here. ANGELICA: So Paul is a little stubborn, like many other kids. I mean, we don't have any other kids, so Paul is our only child, and we don't know any different than all this, you know, the special needs world. But Paul does know a few signs, but he only uses "more." ANGELICA: I mean, we think he understands a lot of the signs, but he just doesn't use them. So we just, we use the basic signs like "want," "need," "do you want to go outside," all the basic signs. But even though he doesn't sign them, we still sign to him. So pictures, which is called PECS. We use pictures. We've got pictures throughout the house, like he has a swing, so there's a picture next to the swing. If he wants to go swing, he'll grab the picture and look for me or his dad if he's around, and give us the picture. That means that he wants to go on the swing. Want to swing? All right! Let's go on the swing! ANGELICA: We also have a binder. Especially when we're in therapy, if he wants to play with a specific toy, he will open the binder and grab a picture. Come here, Paul. Come here! Tell me what you want. Come here. Come here. Come here. Tell me what you want. Hurry! Come on. Oh, you want your snail. So that's how we use pictures. I mean it's been over a year and two or three months that we've been using pictures. It took him a long while to get familiar, but now he is pretty good at it. All right! Let's go outside! Our goal is for him to also learn how to use an iPad to communicate. I mean, he loves the iPad to watch videos and play, but not to communicate. An article with helpful suggestions of physical activities and modifications. A 17-minute video from the Perkins School for the Blind. Paul didn't walk until he was about-- four years old? PAUL (FATHER): About four years old. And he used to use a walker. And he eventually stopped using the walker. Surprised us. ANGELICA: CHARGE syndrome kids, they have balance issues. Before he started walking, I really thought that he was not going to be able to walk. But once he started walking, it's like nonstop. ANGELICA: He has this certain kind of walk. Like, he skips. He's always doing that, everywhere he goes, eh? Say we go outside. There's things that he won't do. If there's a brick, bricks on the ground, he will not cross the bricks. I guess the texture. That's when he needs our hand. He'll guide us and tell us what to do. ANGELICA: Yeah, if it's a different surface, he's really careful. Or if he is not familiar with the area, he will walk holding whatever is close by. But once he's familiar with the environment, he doesn't need our help. ANGELICA: He runs. He loves being chased. He used to get overwhelmed around people, but not as much anymore. He loves being around other little kids. Even though sometimes he's still afraid that somebody is going to push him or-- but he's really careful. He'll find something close by to hold. PAUL (FATHER): I'm a car guy. I have these old car seats that I built as swings in the backyard for him. We'll go out there at therapy time and they utilize the swing. ANGELICA: Well, even with no therapy, we still go. PAUL (FATHER): Yeah, yeah. Especially like after work or something, just me and him time. I'll take him out there. ANGELICA: So we take him to the park. He loves the swing. But now he's maneuvering the park. He's able to go on the slide, and it's pretty much every day. If we don't go to the park, we do wagon rides around the neighborhood. Want to go in the wagon? All right! Come on! Here comes the wagon! PAUL (FATHER): Paul does enjoy going to amusement parks. PAUL (FATHER): Oh yeah, Disneyland, yeah. He really enjoyed the carousel, yeah. ANGELICA: The carousel. The mini roller coaster for kids, he loves that thing. He loves it. PAUL (FATHER): Anything with farm animals, animals, he loves. ANGELICA: My family, they rent a place close by. They got horses, and sometimes we put him on. You know, he goes on the horse. And even the little pony-- lately he hasn't, but the regular horse, he loves just to ride the horse. A 20-minute video from the Perkins School for the Blind. ANGELICA: Paul goes to a school, to a local school. He has a one-on-one aide. He is in the special needs classroom, moderate special needs classroom. It's not a deaf and hard of hearing program. But they do use pictures and also sign language. We have a teacher that comes maybe, I mean, once a month just to see how things are doing. And she is a teacher of the deaf and hard of hearing. So he's getting a lot of support. And he also has speech therapy, physical therapy, occupational therapy, and also he sees-- he gets services from-- vision services. So there is only four kids in Paul's classroom. And a lot of times there's only three or two, because there is always one that miss-- has an appointment. He has his one-on-one aide. But sometimes he has two aides to one kid because there is only two kids in the classroom. PAUL (FATHER): That's good for a lot of interaction. ANGELICA: So there's a lot of one-on-one, you know. He needs a lot of push to do something. Any activity at school, you've got to push him. Otherwise he'll try to get away with it. But, yeah, I mean, we're happy and he's happy in his classroom. So Paul does have ABA therapy, which is therapy that any kid with autism gets at home. He gets 2 and 1/2 hours of therapy a day, sometimes only two hours. So it's up to 15 hours, Monday to Friday-- Monday to Saturday. So it's six days a week of therapy. We have two different therapists. And they work on how to use PECS, how to communicate, behavior. Paul doesn't really have-- nowadays, he doesn't really have any behaviors. I mean, he's really happy. He doesn't throw tantrums or-- not really. PAUL (FATHER): Only when he gets frustrated with something. ANGELICA: He used to get a lot of-- yeah, he used to get frustrated when we were using pictures. He was getting frustrated a lot. But a lot of times he needs a lot of sensory. Like, we use a bouncing ball. We have a swing. We use brushing. We have a bucket full of beans, and he will play with those before therapy. And that will calm him down. Right now we're also working on toileting. You know, going to the restroom and how to wash his hands, wipe his hands. We're working on putting on the jacket, taking off the jacket, putting on the jacket, working on the zipper, and just basic things that he needs to learn. He loves puzzles. He's really good at puzzles, numbers, shapes. As long as-- when he matches something, as long it is the same, he will be able to match it. He loves those kind of activities. Match red. Match red. Yeah, that's red. Match yellow. Match blue. Match green. Match orange. All right! Now you're all done. Information about the Foundation's services for families. An article from the California Deafblind Services newsletter describing the playgroup Angelica and Paul were part of. Look for them in the photos! ANGELICA: You know, I'm learning every day through the CHARGE Syndrome Foundation what other things-- or through other families that are really active on Facebook-- and see what other things that I should be requesting for Paul. We started a playgroup through CDBS, California Deafblind Services, about four years ago, almost four years ago. So we used to get together every other week. We got a grant for that. But once the grant was over, we'd still get together once in a while. We talked about insurance or how to get this service or this other thing, and-- just to get together and have support. PAUL (FATHER): How they're doing. PAUL (FATHER): Yeah, you'd start thinking more positive about your child. ANGELICA: Nobody looks at you different. Nobody looks at your child different, because it's all families who have kids with CHARGE syndrome or a special needs family. But it's just-- everybody understands. PAUL (FATHER): Well, as for me, social media is everything. And it was really hard, I believe, for a father to go through having a special needs child. So I started a group, Fathers with CHARGERS, as my way of communicating with other fathers, because not everybody's going to know what you're going through. But another CHARGE father would. ANGELICA: I mean, I'm involved in a lot of different Facebook pages for feeding or hearing loss or vision loss or heart issues-- you know, there's a page for everything nowadays. If there is a question about something, you just go to the main Facebook page for CHARGE syndrome and then somebody is going through the same situation or they have gone through the same situation, and you can get advice from them. The professionals in CHARGE syndrome, I feel that they're really involved. There is always a professional who will answer your question. And a lot of them, we met them when we went to the conference, and they are really active. So I really feel like we get a lot of support. Any other family, I think, with a kid with CHARGE syndrome gets a lot of support from the professionals or Facebook page. Say hi! Say hi. Where's your glasses? Where's your glasses? Where's your glasses?